Geoffrey Prentice co-founded Skype over a decade ago, where he worked with a small team as Skype’s chief strategy officer to build a leading global telecommunications company. He oversaw its expansion into Asia and Latin America before it was acquired by eBay in 2005. He’s now a seasoned venture capitalist with nearly 20 years of experience founding and investing in technology companies across the globe. His latest venture is Oriente Holdings, a Hong Kong-based regional financial technology company, which he founded last year. Prentice spoke to Business Next about his experiences building financial infrastructure in under-developed Asian nations on the sidelines of the ABAC 2018 Digital Innovation Forum in Taipei. 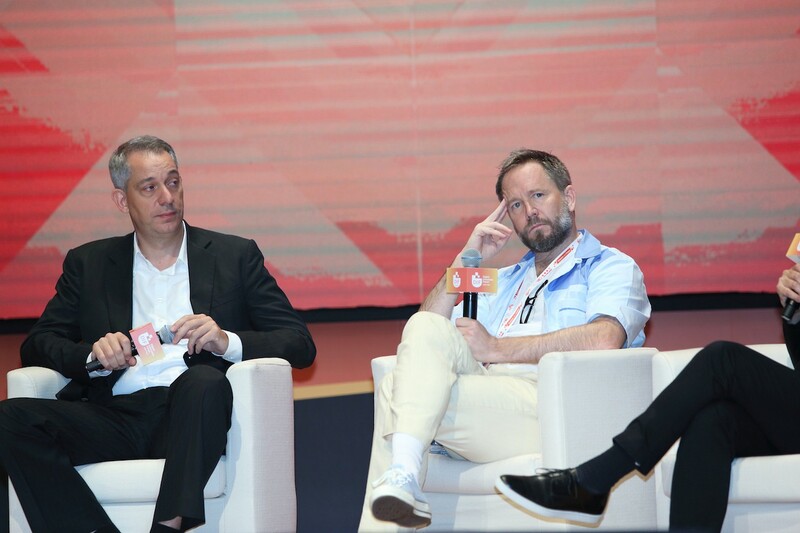 Caption:Geoffrey Prentice (Centre) co-founded Skype attended panel discussion at Digital Innovation Forum Taipei 2018. Q: Tell us about Oriente Holdings. What does your company do? A: Oriente is a financial services and technology company creating financial products built around mobile technologies in Southeast Asia. We saw an opportunity to build a better financial system for consumers in Asia’s fastest-growing economies. Our focus is to grow the markets in countries such as the Philippines, Vietnam, and Indonesia. What is interesting about the Philippines is that there are more mobile phones than there are Filipinos. We thought it would be a good idea to partner with great local companies to create a mobile app to help Filipinos apply for loans. We recently launched our first product, Cashalo—a consumer lending mobile-app —in the Philippines in May. It gives customers access to credit. The app is available for both Andriod devices and iOS devices. We will launch this app in Indonesia in July. At the moment, we have a total of 600 employees across Asia. Our team has offices in Hong Kong, Shanghai, Singapore, Taipei, Manila, Jakarta and Ho Chi Minh City. The team in our Taipei office has about 50 people working on the development of mobile application products. Robert T. L. Lo is the head of the Taiwan team. [He previously was vice president at Zoom.us, a global developer of enterprise video communications and vice president of PCHome Online. In 2004, Lo initiated Skype’s first partnership with a Taiwanese company.We’re looking to grow the Taipei team to 100 by next year. Q: What are your thoughts on data privacy? A: While we are all terrified by people gathering our data, I think the biggest issue is about how the data is being used. Think about people in Southeast Asia. For example, in the Philippines and in Indonesia you have 2% credit card penetration. In places like Vietnam, the Philippines and Indonesia, people are turning to loan sharks who take advantage of them with monthly interest rates as high as 20% or even 30%. What if these people say: Please take my data so that I can get a loan? Data is typically sourced from credit bureaus. But what if there are no credit bureaus in these places? If [these people] don’t have credit scoring, they can’t get a mortgage. And that’s where my company comes in. We’re trying to get rid of these loan sharks. We are using mobile technology to make an impact on financial systems in millions of under-served communities in Southeast Asia. I think what is interesting right now is a lot of these big companies, when it comes to data, they say: Trust me, it’s all good. I’ve got it all taken care of -- and then not exactly deliver on that promise. So I think that’s going to be the issue where governments will step in. Q: What will be Taiwan’s role in the fast-growing markets in Southeast Asia? A: I think Taiwan has great engineering talents, software engineers and product developers. Companies can certainly build great research and development teams in Taiwan. I think Taiwan is a developed market. What company founders can do is to bring Taiwan’s engineering and technology expertise to other rapidly growing markets in developing countries. Q: You’ve visited Taiwan many times over the past decade. What are some of the changes you see in Taiwan’s evolving startup ecosystem? A: I have visited Taiwan more than a dozen times, maybe more, and have met many key players in Taiwan’s startup ecosystem. I have met several leaders from Taiwan’s National Development Council, the government-backed Taiwan Startup Stadium, AppWorks accelerator and more. I think Taiwan has great engineering talents and also, you have a competitive edge with hardware manufacturing. I see many interesting startups are emerging. I think Taiwan’s startup ecosystem is growing for sure. The problem is many Taiwanese companies still focus heavily on the local market, which could be too small to gain much traction. Q: What advice would you give to Taiwanese entrepreneurs? A: You need to think globally from the beginning. You have to. It’s like Sweden. The market size of Sweden forces startups to think globally from day one. Great examples like Swedish digital music streaming service Spotify succeeded because they started globally from day one, Skype started globally and Minecraft started globally. There are so many. I think Taiwanese entrepreneurs have to think and plan globally from day one. Your domestic market is not big enough. Q: What do you see as the next big thing? A: The answer is: if you do know, you’d be very rich. If you look at private companies, big companies like Google, for example, before Google there was a bunch of search engines. Before Skype, there’s a bunch of phone services. Virtual reality and artificial intelligence have been talked about for over 25 years. So I think what’s going to be the next big thing will probably be things that have already happened and didn’t work that will come back again. I don’t know exactly what they will be, but history tells you that’s what happened. I think that artificial intelligence is something that has been talked about forever and is starting to actually have some impact. That’s going to be sort of the next big thing. But I think the core question is not exactly about what’s going to be the next big thing; it’s more about taking that thing and applying it in a way that makes value for the users. That’s the issue. It’s not really the thing —whether it’s blockchain or artificial intelligence—that makes the difference, it’s how that thing is going to be applied that makes the difference.